☯ Why are the Inner UB Points Needled Medially? All of the Inner UB Shu Points are located in muscle tissue above the lungs. As a result it is important to understand the anatomy of this space and needle accordingly. It is recommended to needle the inner line of UB channel (11-23) with an oblique insertion towards the spine. The oblique insertion helps protect from deep needling. But why does the recommendation, “towards the spine," exist? Consider a cross-section of the trunk. This allows one to see the shape of the ribs and lungs. The ribs are curved and form an arc between the scapula and the spine. The deepest aspect of this curve is near the spine. 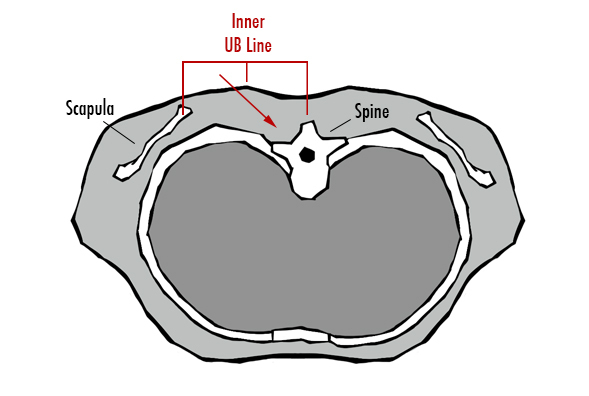 The inner UB line is just medial to the highest and most superficial aspect of the ribs. If we needle medially from the inner UB line we are needling with the curve towards the area where the lungs are deepest and most protected. The back Shu Points are wonderful and powerful points. Using the natural geometry of the body to our advantage we can needle these points safely and with confidence.